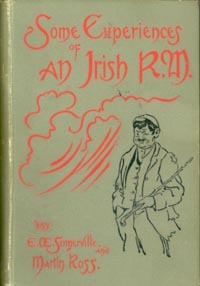 Edith Anna OEnone Somerville and her cousin Violet Florence Martin, of Ross, wrote a large number of novels, short stories, and travel books, including the 3 volumes concerning the Irish RM (Resident Magistrate), and fox hunting. Martin Ross (her nome de plume) died in 1915, though Edith continued to write books under their joint names: Somerville & Ross. Born in Corfu, where her father, Lt Col Somerville was then stationed, Edith spent much of her life in in Drishane House, Skibbereen and later Castletownshend, West Cork. 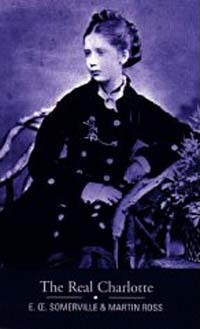 The eldest of 8 children (two of whom became admirals) She became the first woman Master of Foxhounds and, from 1912-19, served as Master of the West Carbery Pack. Perhaps disliking her middle Christian name, she usually signed herself "E.OE. Somerville". "Some Experiences of an Irish RM"
From time to time the cousins visited England. 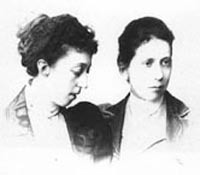 Their first visit was in 1910 to discuss the promotion of their work. They stayed at Kneller Hall on this occasion. There is an account of Violet Martin suffering from a fit of giggles when visiting a church in Richmond. On another occasion Edith, who was very fond of fox terriers, had three on a leash when visiting Twickenham. In her book "Happy Days" (1946) she records the following incident: "in Twickenham one summer's day, a butcher's boy trundling his grim barrow-load, dropped the handles and went down on his knees [to the three fox terriers] and murmured in adoration “naice little fices”. Relatives at Kneller HallOne reason why Edith (with or without Violet) visited Twickenham was the presence of two of her brothers at Kneller Hal, Whitton. The Royal Military School of Music had been established at Kneller Hall in 1857. Irish connections with the school had included Thomas Sullivan who had been Sergeant Band Master at Sandhurst (where Arthur his young son, learnt to play every wind instrument). Thomas Sullivan then transferred to Kneller Hall as a member of the teaching staff (professor of the clarinet. The first to arrive was Edith's brother, Colonel Thomas Cameron FitzGerald Somerville, in June 1910. He had been commissioned as a 2nd Lieutenant in the 1st/4th King's Own Royal Regiment in 1879. In 1906 he commanded the King's Own Royal Lancaster Regiment. He left that regiment in 1910 to become the Commandant at Kneller Hall. In 1911 the Colonel took part in the Coronation Durbar for George V at Delhi. At that ceremony 1600 bandsmen, drawn from 21 British regiments and 25 Indian regiments, performed under his direction. Colonel Somerville retired in 1919 and returned to Castletownshend where Edith still lived. He died in 1942. At Kneller Hall he was succeeded in 1920 as Commandant by his younger brother Colonel John Arthur Coghill Somerville. Jack Somerville had been commissioned a 2nd Lieutenant in the Northumberland Fusiliers in 1892. He served in South Africa from 1899/1901. Transferring to the Royal Sussex Regiment in 1908 he was promoted Lt-Colonel in 1915. He served as a Military Attache in Japan and Korea in 1911/14, and again in 1915/1919, during which year he also saw service in Siberia. Jack Somerville was a keen amateur musician and interested in Japanese music. He had studied singing with Plunket Greene. During his time as Commandant, Kneller Hall was credited with influencing local musical undertakings. One of the prizes awarded annually at Kneller Hall was the Somerville Prize for Military Band Music. Jack Somerville retired in 1925 and settled in London. He acted as Secretary of the Japanese Society from 1927 to 1938. He died in 1955. There was another link with Twickenham. Edith's younger sister Hildegarde married Egerton Bushe Coghill (Edith's mother was a Coghill). Trained as an artist, Egerton helped Edith in her early days. His elder brother was killed trying to save the regimental colours at the disaster at Ishandwana in 1879. As a consequence Egerton was called back to Castletownshend and in 1905 became the 5th baronet. While in England in 1921 he died at Kneller Hall and was buried in the Twickenham Cemetery. However, in 1923 his body was dug up and returned to Ireland for reburial. a butcher's boy trundling his grim barrow-load, dropped the handles and went down on his knees [to the three fox terriers] and murmured in adoration "naice little fices".